Another question from the uneducated. Bicycle Repair Forums - BikeRide › Maintenance & Repair › Brakes & Levers › Another question from the uneducated. Simple one for you. 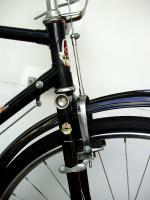 I have an Azzurri Tigre which has the gear changers intergrated into the brake levers. What is this system referred as? Thanks in advance for the education. (01-01-2015, 03:28 PM)bach-biking Wrote: Hey guys. Keeping mind that SRAM, MicroShift, Sunrace, Campagnolo, and ? offer integrated brake/shifter levers also, that are NOT STI. They are all referred to a BRIFTERS. Sunlight and many others, offer MTB style. (01-01-2015, 05:08 PM)nfmisso Wrote: Keeping mind that SRAM, MicroShift, Sunrace, Campagnolo, and ? offer integrated brake/shifter levers also, that are NOT STI. They are all referred to a BRIFTERS.